We had a great experience with Diana and Craig photographing their engagement session around Chicago downtown, some time last year. Time goes by fast and here we are on the wedding day. We met both Diana at their home to photograph them getting ready. The bridesmaids and flower girls were also there getting dressed with Diana. The bride wore a traditional white wedding dress and held a violet and white rose bouquet. The bridesmaids wore deep purple dresses with the exception of one of Diana’s friends who wore a bright teal dress that complimented the purple very nicely. I went with Craig to the hotel near Bloomingdale where his friends were waiting for him and getting ready. Claudia stayed behind to continue photographing the girls getting ready at the home. When I arrived at the hotel, the groomsmen wore traditional tuxedos with blue ties and socks. While we were waiting for the ladies, we had some fun with the guys around the hotel property. Craig and Diana had their first look at the Bloomingdale Golf Club and then we went with their friends and family for a quick photo session around the golf course. Wedding Photography at the Bloomingdale Golf Club always looks nice at this location. The reason for this is that Bloomingdale Golf Club offers a lot of different places to explore, which is a great way to mix up the photo session. The bridal party was a lot of fun to photograph and hang out with! Unfortunately, we could not have an outdoor ceremony because the rain was coming, so the hotel setup a big white tent for all of us to sit under. The officiant was one of Craig’s friends who was very funny Italian type and gave a relaxed vibe to the entire celebration. The couple had an exchange of vows as well as a sand ceremony during this time. When the ceremony was finished, it was time for family portraits at the Bloomingdale venue, then the cocktail party started at 6pm where there were speeches, cut cutting, dinner, and dancing! The cake sat on top of a teal tablecloth and was white with black ribbons at each of the cake’s bases. Purple flowers decorated each of the guest’s tables and we took one final photo of the bridal party and the newly weds sitting at their table before the party started. 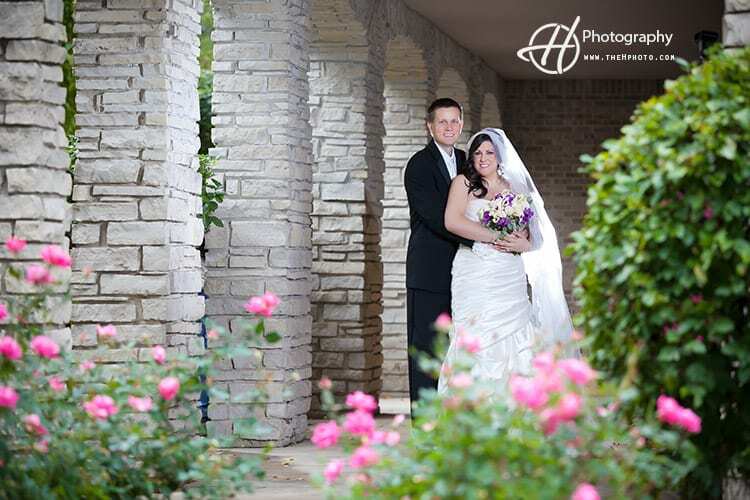 This entry was posted in weddings and tagged Bloomingdale Golf Club IL, Craig and Diana, November wedding, tent ceremony, wedding photos, wedding photos golf course. What a beautiful Bloomingdale Golf Course wedding! The wedding looks like it was so much fun to capture. Thanks Samantha! It was are real fun wedding! Fun and very easy people to work with! What a beautiful and fun wedding! Love that night shot of the Bloomingdale venue! Thank you Corey! The Bloomingdale Golf Club looks really good in night! Absolutely beautiful! You nailed that ring shot at the top, it might be the best ever! Also I love that you can see in each image how much the couple adores each other! The Bloomingdale Golf Club was a beautiful venue…and the fact that they set up a tent for the rain was even better! I love the brilliant colors of this wedding. That ring shot is incredible! Such beautiful photos of a beautiful event! Thank you Christine! The wedding at Bloomingdale Golf Club was so much fun! This wedding at The Bloomingdale Golf Club is beautiful. I love how you all braved the rain a bit and still got gorgeous bridal portraits. Weddings are so much fun! Thank you Brenden. It was the beginning of a long cold weather in Chicago area. I am glad the wedding was at The Bloomingdale Golf Club because even in rain there was a lot of opportunity for pictures. what a fun wedding! This couple will cherish these images for years to come. I love the ring shots! What did you shoot them on?? They look so cool! Thank you Patty! I am glad you like the ring shots! I shot them on a glass table at the hotel. The Bloomingdale Golf Club looks like a great fun venue for a wedding. Great job photographing these wedding day memories! Thank you Leslie! Bloomingdale Golf Club is a great venue for weddings! It has an amazing potential for pictures! Such a beautiful wedding! The photographs are absolutely gorgeous! Such a talented photographer! Gorgeous wedding photography! The Bloomingdale gold course is a beautiful location. I love all the wedding party shots. Thank you Amanda!! The wedding party was a lot of fun to work with!! They were laughing all the the time. Just love the one of the groomsmen and groom on the green in their socks!!! What a fun couple!! !